Writing a BIA brief for an immigration appeal and don’t know where to start? One helpful resource is the BIA’s “precedent table,” which is updated fairly regularly and organized by topic. It is not error-free, and it is no substitute for real legal research. But it’s a good place to start for a quick answer if you’re researching immigration law and BIA decisions to write a brief for your BIA appeal. 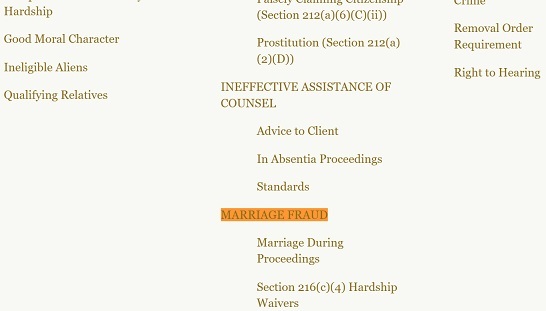 So, for example, if you know one issue in your appeal has to do with an allegation of Marriage fraud, you can access the Board’s cases that reference Marriage fraud in one place. Once you have the key precedent decisions, you can compare to see if the Board has ever issued a decision that is contrary, if it has carved out any exceptions to the rules, etc. Again, this can’t be the only legal research you do. Paid services like Lexis and Westlaw will get you this information much quicker and with less work. For example, this precedent table won’t tell you when a Circuit Court has overruled the BIA on a particular point. Paid services will. But the BIA precedent table is free is a helpful resource that is pretty well-organized and can assist you in starting off in the right direction when writing a brief for a BIA Appeal.